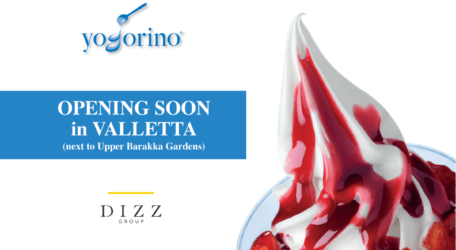 Yogorino, the Italian-rooted frozen dessertery, will be opening its first store in Malta. As the weather will get hotter for the summer season, these enticing frozen yogurt flavour are just the right get away as the new store will open in the heart of Valletta. Yogorino’s store will serve its world-renowned frozen yogurt; a quality, light and delicious product, with a delicate but distinctive flavour. Yogorino will be joining DIZZ Group portfolio of other world-renowned brands. Yogorino products are considered a taste experience for everybody and over the years the Italian brand experts have studied and refined the product quality in order to continuously improve the flavour and properties hence offering the best possible frozen yogurt in the world. There are hundreds of Yogorino stores around the world, mainly in Europe, South America, North America, Africa and Asia. From a small store in Verona, Yogorino has managed to conquer the market in just a few short years. No doubt this is a clear indication of the demand for Yogorino’s high quality in the international market. “All Yogorino stores promises consistency, reliability and a variety of products and the new one in Valletta won’t be an exception. Besides selling 14 million cups every year, this franchise chain also offers a very tasty list of excellent products, including ice cream, coffee etc. Our commitment as DIZZ Group is to bring the best brands and franchise chains to Malta and we are pleased to introduce Yogorino locally. I have had the opportunity to visit the Yogorino factory in Bergamo and was impressed with their quality and high level of products,” said Diane Izzo, CEO at DIZZ Group. Yogorino was conceived in Italy in 1993, before becoming a leader in the frozen yogurt field. Over the years, the Yogorino brand has gained more success and built an imposing reputation in its respective industry.